The sweet sound of the exhaust note adds extra realism to the rally machine running style.  Official car to compete for the Kyosho Trophy, with a 2.4GHz R/C system in a Readyset package! ●Fully assembled Readyset. Just add fuel and batteries to run. ●Use optional clear parts to create even greater scale realism with headlights and tail lights. ●Pre-cut and pre-painted body is complete with decals applied. ●Equipped with powerful GXR-18 engine fitted with recoil starter. ●Large air cleaner works effectively to extend the maintenance cycle of the engine. ●Downward facing offset of the muffler exit eliminates the need for exhaust holes in the body. ●Dual disk brakes allow individual brake settings on the front and rear. ●Racing design features include a transponder stay and a quick opening fuel tank cap. ●Optional clutch springs and clutch shoes provide a variety of power feel settings. ●NOTE) Fuel, AA-size alkaline batteries x 8 for R/C system and engine starting tools are all sold separately.